Elliot Justham: 6.5 - Most of his work was done from range as Newport took a number of pot shots. Handling stood up to the test though and his swift distribution helped Town on to the front foot. Stephen O’Donnell (STAR MAN): 7 - Full back was charging forward on the right flank once more and did more than most to try and find a way through. Kept it tight defensively too. Dan Potts: 6.5 - Again defended his left flank well and tried to create width going forward, but still prefers to turn back to safety when a burst forward might pay dividends. Glen Rea: 7 - Won the majority of his aerial battles against John-Lewis and another promising performance at the back, but paid the price for one error as was caught out of position for Newport’s leveller. 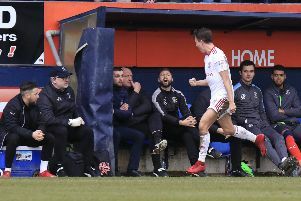 Alan Sheehan: 7 - As ever, demonstrated a coollness in possession when bringing the ball out of defence and appears to be thriving with the added responsibility of the captain’s armband. Alex Lawless: 6 - Can consider himself very unlucky to have been sacrificed early on when Town made a chance. Not at his best, but wasn’t the worst either. Olly Lee: 6 - Lovely cross for Marriott’s leveller further demonstrated his fine array of passing but on this occasion, too many were often picked off by the visitors. Pelly Ruddock Mpanzu: 6 - Was having one of those games for the first half an hour where absolutely nothing at all came off. Improved as the match wore on though as he came closer than most, denied excellently by Day. Danny Green: 6 - Plenty of effort by the winger but delivery from the right flank was never at its best on the day as Newport were able to clear with ease at times, particularly at set-pieces. Josh McQuoid: 6 - Never really had the impact he would have liked to as found a number of attacking moves broke down before they could ever really bear fruit. Joe Pigott: 6.5 - Could and probably should have added to his tally of three in two games with the two best chances for Luton, but on both occasions, didn’t hit the target. Cameron McGeehan (SUB): 6.5 - On for Lawless midway through the first half and kept leading Town’s attacks from deep, although at times chose the wrong option. Zane Banton (SUB): 7 - Longest cameo so far for Banton as he had half an hour to impress and was always lively from the off, constantly trying to find an opening. Jack Marriott (SUB): 7 - Off the bench and scored within 12 minutes of coming on with near post header to move one clear in the top scorers charts.